The Oijanen system continues to star in headlines as the Drone Regions Federation (DRF) and Project.Mayhem. [16-13], backed by Snuffed Out [B B C], clashed in the system for the third day in a row. The battle was prompted by a Project.Mayhem. Astrahus citadel which had been previously reinforced by DRF forces. With the citadel set to exit its invulnerability period the night of the 15th, both sides prepared for another brutal engagement. Snuffed Out and Project.Mayhem. organized a joint Rattlesnake battleship fleet of 120 pilots with a Minokawa and Lif force auxiliaries in tow. The force bridged on top of the Citadel and tethered, waiting for hostiles to arrive. A few moments later, allies in the form of a 180 pilot Machariel battleship fleet belonging to Circle-Of-Two [CO2] bridged in alongside it. The new fleet set up on the citadel as well and joined the watch. The two fleets waited a while, the structure exiting reinforcement mode in the meantime and initiating self-repairs. With less than 2 minutes remaining before the structure would once again be whole, DRF forces entered the system from the BWF-ZZ gate and warped to the grid at a ping. 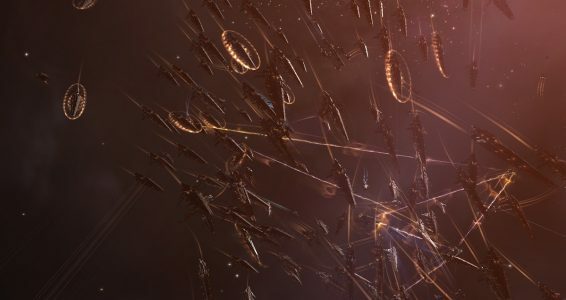 The DRF had assembled a full (256 pilots) Machariel fleet of its own. As the fleet landed, the battleships aligned towards their hostile counterparts and initiated another warp, landing this time near the two allied fleets. Without pause, both sides anchored up and opened fire, starting the fight. The DRF went straight after the Rattlesnakes, hundreds of autocannons hammering at the robust shields of the battleships. The Rattlesnakes returned fire, deploying sentry drones and launching swarms of cruise missiles at the hostile Machariels, the firestorm of explosions engulfing the hulls and incinerating armor plates. Circle-Of-Two contributed as well to the ensuing battle, its Machariels also armed with autocannons. Their turrets proved no less deadly as they tracked their hostile counterparts and delivered coordinated fire barrages, nearly a thousand rounds hurled at their enemies continously. Within seconds, mainline ships on both sides caved in to the initial assault, either ripped apart in devastating crossfire or suffering critical damage and exploding in bright flashes, illuminating the grid momentarily. Yet as the initial shock subsided and logistics wings became accustomed to the rhythm of the battle, the DRF found itself hammered on both sides. With its force auxiliaries, the Rattlesnake fleet was able to quickly stabilize, soaking up the incoming damage and holding for the most part. Realizing the problem of disposing of 2 force auxiliaries, especially with the lessons of previous fights, the DRF lit a cynosural beacon on the field, ushering in 2 squadrons of dreadnoughts. The dreadnoughts jumped into the battlefield and entered their siege cycles, their capital turrets slowly turning until the Snuffed Out\Project.Mayhem. force auxiliaries were squarely in their sights. Once locked on target, the enormous weapon systems came to life; great beams of laser, torpedoes as big as frigates, autocannon rounds the size of shuttles and giants spheres of super heated plasma poured forth, smashing their way to the immobile force auxiliaries. While its dreadnoughts targeted the Rattlesnake fleet, the DRF changed targets to the Circle-Of-Two Machariels. Its primary targets were the many Bhaalgorn battleships they had, whose heavy energy neutralizers posed a serious danger to its capitals. Autocannon rounds blasted at the heavy armor plating of the battleships, gouging deep holes and burrowing ever deeper before penetrating the internal structure. Once inside, the 800mm rounds tore apart decks and damaged vital systems, often causing the ships’ internal reactors to go critical and unleash their wrath in devastating explosions that broke the hulls apart. Circle-Of-Two ignored their predicament and focused on the DRF capitals. Hundreds of rounds were continuously spat, hitting the giant ships. The munitions fell on the thick armor of the dreadnoughts, chewing through the many layers of reinforced metal and exposing the vulnerable super structure beneath. With the armor stripped, the munitions exploded within the enormous ships, tearing their innards apart. One by one, the behemoths’ guns grew ominously silent, deck lights flickering before series of explosions erupted from within their holds, clawing their way out in great tongues of fire. Entire segments were flung across the void as the massive explosions radiated outwardly. Time after again the warring pilots were blinded by the bright flashes which signaled the demise of another dreadnought. With the DRF’s attention squarely laid on Circle-Of-Two, the Rattlesnake fleet took the opportunity to gain some distance from the ensuing melee, getting away from the host of dreadnoughts which was contributing its own considerable firepower to the mix. The battleships split their damage, firing salvo after salvo of cruise missiles at the dreadnoughts on the grid while concentrating their drones’ fire on the DRF Machariels. At this point another fleet arrived on grid – A Pandemic Legion [-10.0]\Northern Coalition. [NC] 158 pilot Proteus strategic cruiser fleet. The two alliances had learned of the fight and formed separate fleets, but decided to unite them en-route. Once in the system, the joint fleet warped at approximately 70 kilometers of the Circle-Of-Two fleet and opened fire, joining the fight on the DRF’s side. Rail guns and beam laser batteries concentrated their fire on the Circle-Of-Two’s battleships. At the same time, the DRF switched its focus back to the Rattlesnakes, burning towards them, autocannons blazing all the while. With their force auxiliaries destroyed, the Rattlesnakes could not tank the incoming damage. One by one battleships caved in to hail of autocannon rounds. Generators protested, overheating as slugs collided with great force at the shields. The constant barrage did not let up, causing many generators to shut down resulting in the shields dissipating. With the shields gone, the rounds fell on the vulnerable hulls beneath, ripping them apart. Rattlesnakes were reduced to perforated wrecks within seconds as the onslaught continued. This forced the Rattlesnake fleet to light a cynosural beacon and bring a third force auxiliary to the field in order to augment its failing logistics wing. As the battle continued, a fifth fleet entered the fray. Test Alliance Please Ignore [TEST] had brought a 180 pilot Hurricane battlecruiser fleet to the system. It too learned of the battle just as it started and hastily formed up and made best speed to the system. Once in Oijanen, the Hurricane fleet probed the DRF’s logistics wing and warped to it, landing 70 kilometers away from it. Once on grid, the Hurricanes opened fire, artillery cannons lobbing shell after shell into the relatively fragile Oneiros and Guardian logistics cruisers. As the DRF’s logistics wing came under attack, the Proteus fleet took notice of the new arrivals. After a hard struggle to break the tank of the Circle-Of-Two’s Machariels, the Hurricanes offered an easy target. Disengaging, the Proteus fleet warped to a perch above the grid before it probed the battlecruisers and warped back down, landing on top of the Test Alliance Please Ignore fleet. Within moments, super heated plasma charges and laser beams cut into the battlecruisers, overwhelming their shields and incinerating their hulls. The Hurricanes did not take this quietly and returned fire, their fury poured in a hail of shells which overwhelmed the strategic cruisers. The two fleets quickly tangled up, the Hurricanes burning away from the citadel and the strategic cruisers pursuing them, trying to keep close and negate some of the artillery fire. Effectively, the two fleets had become locked in their own battle which was drifting away from the main carnage on top of the citadel. On the citadel, things looked grim for the DRF. The defenders managed to neutralize most of its dreadnoughts, the few remaining having drifted away from optimal range of their guns, turning them into nothing but a nuisance at best. As for the Rattlesnake fleet, it brought a new Minokawa force auxiliary to the field and was rapidly stabilizing. Forced once more to turn its attention to its hostile counterpart, the DRF’s Machariels traded blows with Circle-Of-Two’s, all the while hemorrhaging ships to the Rattlesnakes’ missile salvos. As losses mounted, the DRF attempted to turn the tables once more. Another cynosural beacon went up and another DRF capital squadron entered the field, this time containing 2 Apostle force auxiliaries. With the new force auxiliaries, the DRF’s sub capital force managed to stabilize while directing its firepower to the lonely Minokawa of Snuffed Out\Project.Mayhem.. The immense firepower of the Machariel fleet backed by several dreadnoughts was more than enough to dispatch the Minokawa. It languished for a few moments under the relentless barrage before succumbing to it and exploding in a bright flash. 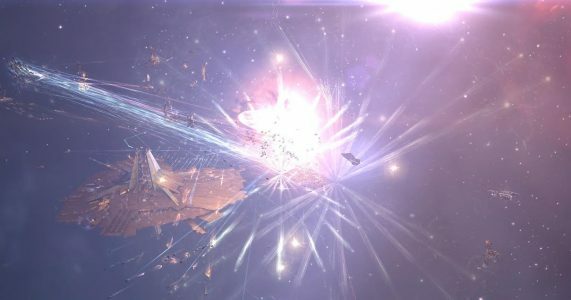 The defending fleets did not waste a moment and switched targets as well, focusing their attention on the new dreadnoughts and force auxiliaries. The answering volleys more than avenged the fallen Minokawa, taking down dreadnought after dreadnought as well as one of the Apostles. 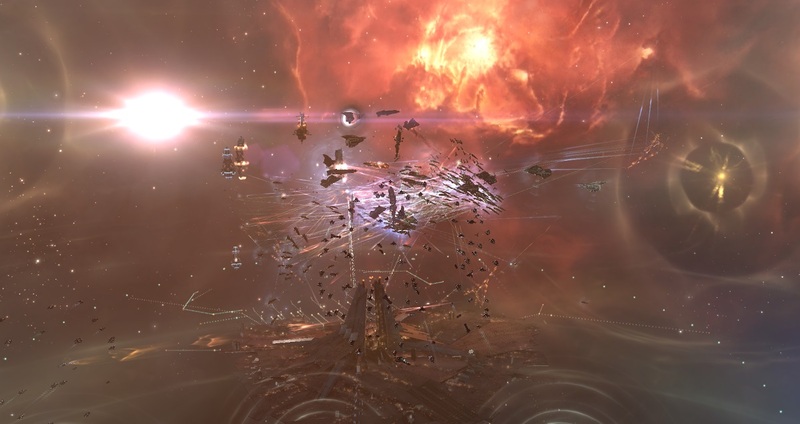 A few minutes later, the third DRF capital squadron was in ruins; only one Apostle survived the carnage, remaining on the field and giving support to its sub capital fleet. The DRF Machariel fleet at this point had swarmed the Rattlesnakes, the two fleets becoming indistinguishable from one another. Autocannon fire and missile salvos met at point blank range. Losses continued to mount for both sides as they struggled in a battle that had become a close quarters slug. Circle-Of-Two continued to fire from afar, aiming carefully so as not to hit friendly ships. 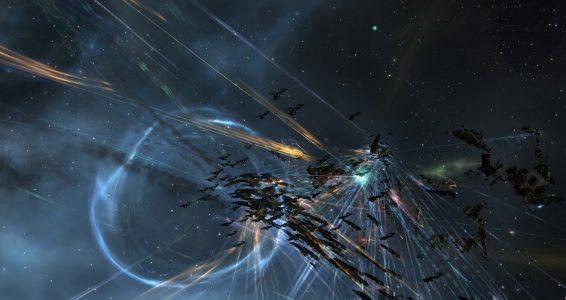 As the battle on the citadel spiraled into a savage exchange, the battle between the Hurricane and Proteus fleets continued unabated. The two fleets seemed completely oblivious to what was going on the citadel, locked in their own desperate struggle. It was the Test Alliance Please Ignore fleet which was losing the fight, the strategic cruisers tearing its mainline ships in growing numbers while suffering only the occasional loss, most often a support ship rather than one of its Proteus or Legion strategic cruisers. Back on the citadel itself, the Rattlesnake fleet was forced to summon its last Minokawa, lighting another cynosural beacon and bringing in the ship out of the optimal range of the surviving DRF dreadnoughts. The new force auxiliary set out to reinforce the stressed and exhausted logistics wing of the Rattlesnake fleet, its capital remote shield transfers making the difference. With the Minokawa on grid, the Rattlesnake fleet earned itself a brief reprieve. It kept fighting without faltering, exacting a hefty price from its attackers. The DRF had to again contend with their enemies’ force auxiliary. Without delay, autocannons thundered away, muzzles flashing bright white as they hurled round after round into the Minokawa. It resisted as long as it could, but like its sister ships, it could only delay the inevitable. With great effort, the DRF overcame its massive shields, tearing apart the structure beneath it and consigning it to oblivion. As it tore apart in a series of massive explosions, its wreckage flung across the grid, it joined the hundreds of victims which the battle had already claimed. By then the void around the citadel had become a graveyard. The enormous broken hulls of more than a dozen of capital ships drifted forlornly around the structure, with hundreds of smaller wrecks marking the fate of battleships and their support. The slowly coalescing field of debris continued to be illuminated by the unrelenting fire exchange, flashes of bright light marking another addition to its growing numbers. At this point, the battle had raged for a good hour. The Hurricane fleet had been thoroughly ravaged, having lost most of its mainline ships. Its remnants had no choice but to warp out to safety, leaving the Proteus fleet to dispatch stragglers. At the same time, the battle on the citadel was far from being decided, with both sides trading mainline ships at an even rate. Yet while the defenders’ numbers slowly depleted, the DRF continued to reinforce its fleets. With its main staging system next door, Machariels and logistics cruisers trickled in, replacing losses and keeping its fighting strength at maximum. The defenders had to make a decision. With Pandemic Legion\Northern Coalition. poised to join the main fight and their own members exhausted from the fierce fighting, the only logical choice seemed to be to retreat. Thus, the Rattlesnake fleet and the Circle-Of-Two Machariel fleet disengaged, warping off and conceding the field to the DRF. The DRF dispatched the few stragglers it could hold and it and Pandemic Legion\Northern Coalition. loitered on the grid for a while longer. One by one, the two victorious fleets extracted from the system, allowing the defenders to return to the citadel. 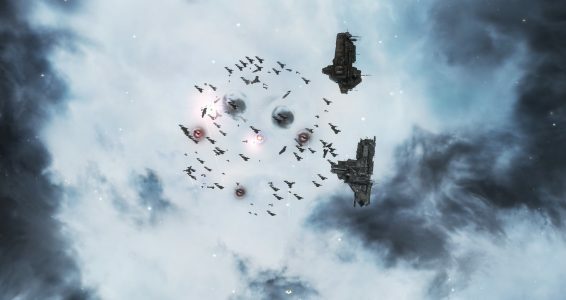 On the citadel, the two defending fleets parted ways, bridging out and dispersing to their respective staging systems. Thus the fight for the Project.Mayhem. citadel came to a close, with the defenders scoring a strategic victory but being dealt a tactical defeat. Battle report for the Oijanen system can be found here. All told the battle raged for 72 minutes with Time Dilation being ever present, hovering around 30% for most of the fight and reaching peaks of up to 13% at times. The system itself hosted 972 pilots at the height of the fighting. Project.Mayhem. and Snuffed Out lost 54 ships including 4 force auxiliaries and 33 battleships for a total of 40.87 billion ISK damage. 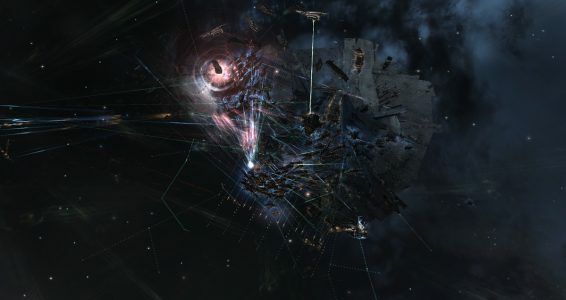 Circle-Of-Two lost 83 ships including 36 battleships for a total of 18.47 billion ISK damage. Pandemic Legion and Northern Coalition. lost 28 ships including 17 strategic cruisers for a total of 17.42 billion ISK damage. 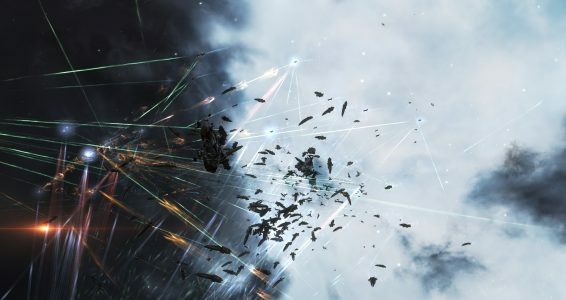 Drone Regions Federation lost 104 ships including 14 dreadnoughts, 1 force auxiliary and 54 battleships for a total of 75.37 billion ISK damage. Test Alliance Please Ignore lost 122 ships including 97 battlecruisers for a total of 13.76 billion ISK damage. The battle was also the first major engagement using the revamped fleet links system. When reached for comments, the different fleet commanders who participated in the fight had mixed reactions. Some praised the new system for streamlining fleet boosts and putting extra emphasis on positioning for fleets. Others saw the new system as unreliable and too simplistic compared to the previous iteration. Another fleet commander simply stated that without further experience, it is impossible for him to rate the new system and that only time would tell. Wow, marvelous weblog structure! How lengthy have you ever been running a blog for? you made blogging glance easy. The full glance of your web site is excellent, as smartly as the content! I just want to say I am newbie to blogging and definitely liked your page. Probably I’m likely to bookmark your blog post . You certainly come with amazing writings. Thanks a bunch for sharing with us your blog. You completed certain nice points there. I did a search on the issue and found the majority of people will consent with your blog. Can I simply say what a relief to discover somebody that really understands what they are talking about over the internet. You actually know how to bring a problem to light and make it important. More and more people need to read this and understand this side of the story. I was surprised you are not more popular given that you surely possess the gift. Hi there! This post couldn’t be written any better! Looking at this article reminds me of my previous roommate! He always kept preaching about this. I am going to send this post to him. Fairly certain he will have a great read. Thank you for sharing! I am brand-new to blog memberships as well as I am looking for a very easy visitor that behaves and also arranged that allows me view my blog sites from my homepage or has a little scrollbox that is always up on the side of the computer display. I began to make use of bloglines but it is truly unorganized with all the blog site names aligned on the side. Thanks a whole lot!. Am i lawfully in charge of material on my blog sites & online forums that have written? I cling on to listening to the news talk about getting free online grant applications so I have been looking around for the finest site to get one. Could you advise me please, where could i find some? great put up, very informative. I ponder why the other experts of this sector do not realize this. You must proceed your writing. I’m confident, you have a huge readers’ base already! Very efficiently written post. It will be useful to anybody who utilizes it, as well as me. Keep doing what you are doing – looking forward to more posts. you’re in point of fact a excellent webmaster. The website loading pace is amazing. It seems that you are doing any distinctive trick. In addition, The contents are masterpiece. you have performed a fantastic process on this topic! Without asking to erase it, exists a method i can remove my very own blog site comments on another person’s blog site? Please assistance(:.